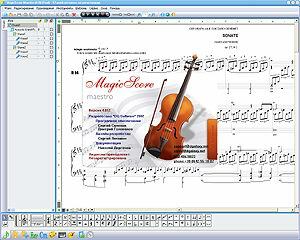 MagicScore School 5 is specialized notation software for music aficionados, students, teachers, schools and colleges. The program offers people interested in music a variety of notation options � input, editing, printing, correctness check and much more. MagicScore School 5, as the name implies, has been specially created for folks who are learning music, but professional musicians can use it as well. ...... If there is something incorrect with the notes, MagicScore School 5 will alert the user right away. If necessary, that person can easily add or delete notes manually as well as perform other editing operations, like transposing separated notes or selected blocks of notes. MagicScore School 5 is also capable of reading notes from MIDI and Karaoke files, as well as recording MIDI and Karaoke files. The player module is capable of playing notes for the selected instruments or the entire orchestra. Volume, balance and effects can be adjusted individually for each score instrument. Another handy feature MagicScore School 5 comes with is the notes printing option (including MIDI files) with preview. The program is also capable of printing blank staff notation sheets. The program also supports Music XML format. The program supports multiple languages. Music Notation Software for Professionals and Music Composers. School library automation software with staged pupil participation. Qweas is providing links to MagicScore School 5.4 as a courtesy, and makes no representations regarding MagicScore School or any other applications or any information related thereto. Any questions, complaints or claims regarding this application MagicScore School 5.4 must be directed to the appropriate software vendor. You may click the publisher link of MagicScore School on the top of this page to get more details about the vendor.